The curse from ancient times continues to the present times when “The Pyramid” was unearthed by a team of a father-daughter, both scientists along with their crew and two journalists looking for proof of civilization from centuries past. Believed to be the curse of the pharaohs against adventurers who dare disturb their sacred tombs, history has recorded ample proofs that the curse is indeed a strong unseen force not to be toyed with even at the time of breakthroughs in technology. From the 1600s that saw ships submerged by brutal storms that carries mummies and treasures from the pyramids to the 1900s when Tutankhamen’s tomb was opened that had a series of horrifying deaths that befall every excavation team, now follows the latest find of the century wherein a 3-sided pyramid had been dug from the deserts of Egypt. 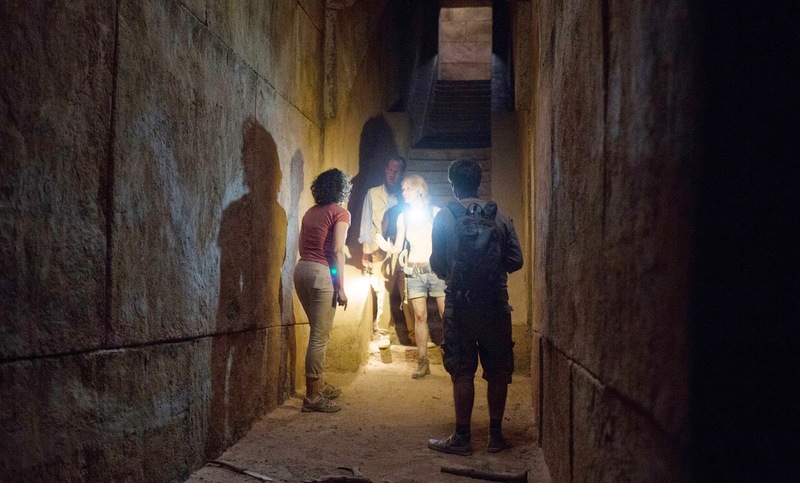 Once the entrance to the pyramid had been unlocked, the group decided to take a quick tour and record the writings and treasures hidden in the tombs – only to find out that the walls are built to keep people inside from escaping. In their quest to get out of the pyramid alive, they discover that they are not just trapped but have become the target of a vicious creature that have been lurking inside the pyramid for centuries. Opening across the nation on December 10 in cinemas from 20th Century Fox, “The Pyramid” is shot in found footage style directed by Grégory Levasseur starring Denis O’Hare, Ashley Hinshaw, James Buckley, Amir K and Christa Nicola.